How do you get to the Sonian Forest? This map shows the train and Metro stations, the tram stops and the bus connections that bring you to and from the forest. On it you will also find the car parks, the Villo! bicycle storage racks and the access gateways. 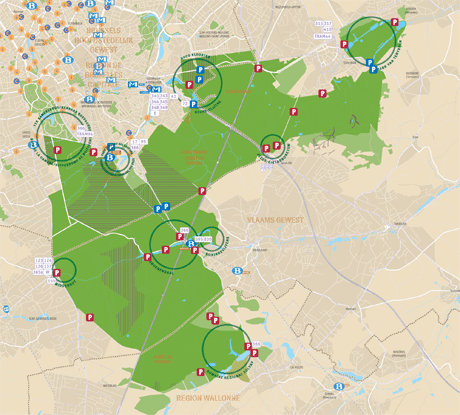 The Sonian Forest lies in the municipalities of Auderghem, Hoeilaart, La Hulpe , Overijse ,Sint-Genesius-Rode, Tervuren, Uccle, Waterloo, Watermael-Boisfort and Woluwe-Saint-Pierre. The two stations which are located closest to the entrance to the forest are the Boitsfort and the Groenendaal stations. On the perimeter of the forest, there are also various tram and bus stops as well as the Herrmann-Debroux (Auderghem) Metrostation. Choose a starting point and map out your route from there. From the Brussels Central Station, take Metro 5 in the direction of Herrmann-Debroux. Get out at the Herrmann-Debroux station. From there, it is a ten-minute walk to the Rouge-Cloître Abbey. Click on www.mivb.be for the timetable. Bus line 41 (MIVB) in the direction of Transvaal and Bus line 72 (MIVB) in the direction of Adeps also stop at the Herrmann-Debroux stop. Click on www.mivb.be for the timetable. The following De Lijn buses stop at the Herrmann-Debroux stop: Line 341 Waver-Etterbeek, Line 343 Maleizen-Etterbeek, Line 348 La Hulpe-Etterbeek, Line 349 Ottenburg-Etterbeek, Line 504 Tombeek-Etterbeek, Line 544 Maleizen-Woluwe, Line 547 Overijse-Woluwe and Line 548 Huldenberg-Woluwe. Click on www.delijn.be for the timetable. Bus line Conforto (TEC) Louvain-la-Neuve-Wavre-Ixelles and Bus line E (TEC) Eghezée-Wavre-Brussels stop at the Herrmann-Debroux stop. Click on www.infotec.be for the timetable. From the Brussels Central Station, take the train to the Groenendaal Station, which is located within the Sonian Forest. Click on www.belgianrail.be for the timetable. The following De Lijn buses stop at the Groenendaal Station stop: Line 395 Hoeilaart-Leuven, Line 553 Groenendaal-Tervuren, Line 598 Groenendaal-Overijse-Heverlee and Line 830 Groenendaal-Tervuren-Zaventem-Machelen. Click on www.delijn.be for the timetable. From Ottignies, Rixensart, Genval orLa Hulpe, take the train to the Groenendaal Station, which is located within the Sonian Forest. Click on www.belgianrail.be for the timetable. Bus line 366 (TEC) Court-Saint-Etienne-Rixensart-Ixelles stops at the Groenendaal Brug stop, close to the Groenendaal Station. Click on www.infotec.be for the timetable. From the Brussels Central Station, take the train in the direction of Louvain-la-Neuve-University to the Station of La Hulpe. From there it is a twenty-minute walk to the Castle of La. Click on www.belgianrail.be for the timetable. Bus line 558 Braine-l’Alleud-Genval-La Hulpe (TEC) stops at the Nysdam stop in La Hulpe, just a stone’s throw from the Solvay Domain. Click on www.infotec.be for the timetable. From Ottignies, Rixensart or Genval, take the train to the Station of La Hulpe. From there it is a twenty-minute walk to the Castle La Hulpe. Click on www.belgianrail.be for the timetable. From the Brussels Central Station, take Metro 1 in the direction of Stokkel until the Montgomery stop. Then take tram line 44 to the terminal station. Click on www.mivb.be for the timetable. The following De Lijn buses stop at the Tervuren Museum stop: Line 315 Kraainem-Tervuren-Leefdaal-Leuven, Line 317 Kraainem-Tervuren-Bertem-Leuven, Line 519 Tervuren-Moorsel, Line 526 Tervuren-Heverlee, Line 555 Sint-Pieters-Woluwe-Leuven and Line 558 Tervuren-Leuven. Click on www.delijn.be for the timetable. The following De Lijn buses stop at the Terminus Tram 44 stop: Line 315 Kraainem-Tervuren-Leefdaal-Leuven, Line 317 Kraainem-Tervuren-Bertem-Leuven, Line 519 Moorsel-Tervuren, Line 526 Heverlee-Tervuren, Line 555 Leuven-Sint-Pieters-Woluwe, Line 558 Leuven-Tervuren and Line 410 Leuven-Brussel. Click on www.delijn.be for the timetable. From the Brussels Central Station, take the train in the direction of Louvain-la-Neuve-Universityto the BoitsfortStation. Click on www.belgianrail.be for the timetable. Tram line 94 Stadion-Louiza-Trammuseum (MIVB) stops at the Hippodrome of Boitsfortstop. Click on www.mivb.be for the timetable. Bus line 366 Court-Saint-Etienne-Rixensart-Ixelles (TEC) stops at the Hippodrome of Boitsfortstop. Click on www.infotec.be for the timetable.